Why Mormons don’t like Donald Trump. A history of persecution—and a demographically diverse present—has led the church away from Trump. Could Utah go to Clinton? 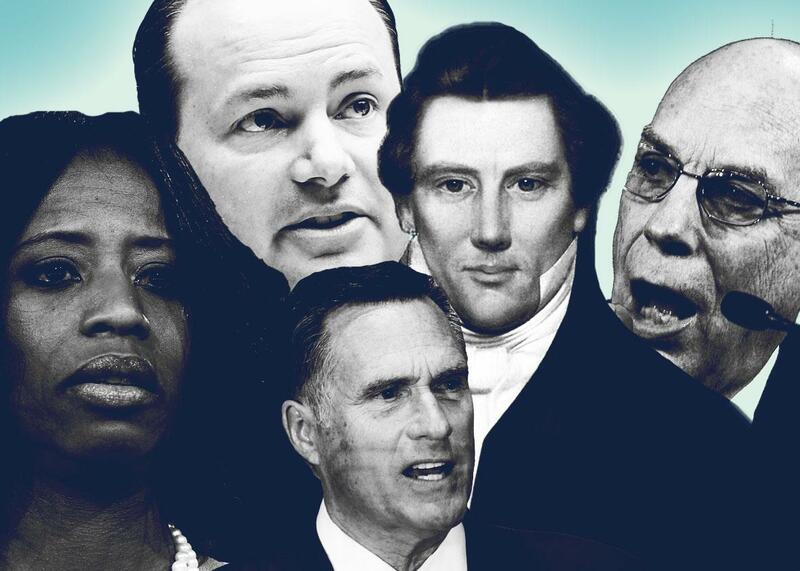 Prominent Mormons: Utah Rep. Mia Love, Sen. Mike Lee, former presidential candidate Mitt Romney, LDS founder Joseph Smith, and the late Sen. Bob Bennett. Photo illustration by Slate. Images by Alex Wong/Getty Images, Mark Wilson/Getty Images, Manpreet Romana/Getty Images, George Frey/Getty Images, and Community of Christ. Trump is counting on his supposed legions of Mormon friends to help him secure the heavily Mormon states of Utah and Arizona, both of which he needs to carry in November to have any chance of winning the White House. The Church of Jesus Christ of Latter-day Saints, or LDS, is the most reliably Republican religious group in the country. Despite Trump’s claims of massive Mormon support, however, many Mormons have not looked fondly on his candidacy. In fact, most of Trump’s Mormon friends must have stayed home on caucus night in Utah. He finished third (14 percent) to Ted Cruz (69.2 percent) and John Kasich (16.8 percent). Things haven’t looked much better since. A poll from earlier in the summer showed Clinton and Trump tied at 35 percent. The Clinton campaign is confident enough that the state is up for grabs that it’s sending Bill Clinton to campaign there later this month. Utah hasn’t voted Democratic since 1964. In 2012, Mitt Romney carried it by 48 points. Romney, the most famous Mormon in the world, is also the most famous Never Trumper, which surely hasn’t helped the candidate’s cause. Yet Mormon wariness towards Trump goes beyond the GOP’s 2012 presidential nominee. In early July, at a closed-door meeting on Capitol Hill intended to build party unity, Sen. Jeff Flake of Arizona—another prominent Latter-day Saint whose Mormon pioneer ancestors helped settle northern Arizona—confronted Trump about his attacks against Mexicans and against Gonzalo Curiel, the Mexican American judge overseeing the Trump University lawsuit. From the outset of his unlikely candidacy, there was speculation that Trump, the thrice-married, former pro-choice Democrat, would have trouble winning over religious conservatives. But as more (white) Protestant leaders and laypeople have moved toward Trump during and after the primaries, Mormons haven’t budged. By “Utah values,” Herbert means Mormon values. Mormons make up 60 percent of the state’s population and dominate Utah’s political and cultural landscape. These Mormon values include more than just objecting to Trump’s baleful and juvenile personal style, “the bullying, the greed, the showing off, the misogyny, the absurd third grade theatrics,” as Mitt Romney famously summarized it during his anti-Trump speech at the University of Utah in March. As Romney suggested in the same speech, Utah values also conflict with a campaign that is based almost exclusively on creating “scapegoats of Muslims and Mexican immigrants”—all in the hopes of stoking white Americans’ economic and racial anxieties. The Mormons know something about being scapegoats. The church and its members haven’t forgotten that the Mormon past was in large measure defined by state-sponsored persecution and even violence. But the Mormons’ reluctance to embrace Trump is also connected to the Mormon present. Mormonism is an increasingly global religious movement that is experiencing some of its largest growth in Latin America, especially Mexico. Let’s start with the Mormon past. The fact that the Mormons became so thoroughly connected with the Republican Party may today seem inevitable. But that is not the case. The Republican Party was founded not only as an anti-slavery party but also as an anti-Mormon party. On their first presidential platform in 1856, the Republicans vowed to fight the spread of the “twin relics of barbarism—Polygamy and Slavery.” Throughout much of the rest of the 19th century, Republicans in Congress and in the White House led efforts to pass and enforce anti-polygamy laws. As a result, many polygamous Mormon men were imprisoned. Others fled to polygamous strongholds in Mexico (including Mitt Romney’s own great-grandfather, Miles Park Romney). In 1890, the LDS church announced the “Manifesto,” which officially ended polygamy and allowed Utah to become a state in 1896. Church leaders instructed their membership to join one of the two national parties. Some prominent Mormons urged Utahans to join the Democrats. Unlike the Republicans, the Democrats hadn’t made it their mission to destroy polygamy, the signature cultural and theological practice of the Mormon faith. However, church apostle and future church president Joseph F. Smith, the nephew of Mormonism’s founder Joseph Smith Jr., published a widely circulated treatise arguing that “the people of Utah should be Republicans.” It’s true that the party had been the Mormons’ chief antagonists in the recent past. But Smith explained that the Mormons shared with Republicans a belief in hierarchal institutional authority. The Constitution—which the Mormons believe is inspired by God—established a hierarchy of responsibilities and powers, with the federal government at the top and state and local governments at lower rungs. Smith argued that it was the federal government’s responsibility to guarantee citizens’ rights—including the right to religious liberty—and to intercede in state and local affairs when those governments fail to protect those rights. Today, GOP ideals are much more defined by local control and fostering personal liberty by shrinking the federal government. But in the 1890s, with the memory of the Civil War still fresh in the national memory, the Republicans remained committed to federal sovereignty over the kind of states’ rights ideals that had left the Mormons vulnerable to mistreatment. Joseph F. Smith urged Utahans to recall the experiences of the first generation of Mormons, like those of his uncle and namesake. In the 1840s, Joseph Smith Jr. appealed to the federal government to protect his faithful from what the Mormons understood as unconstitutional abuses. In the run-up to the 1844 presidential election, Joseph Smith Jr. petitioned likely presidential candidates Henry Clay, James K. Polk, and John C. Calhoun. But the politicians refused to use the powers of the federal government to protect the Mormons. Such authority, they argued, was reserved for the states. As a result, Joseph Smith Jr. decided to run for president himself. He hoped that his growing national stature would insulate his community from further attacks by local anti-Mormons. The strategy failed. In June 1844, Smith along with his brother Hyrum was assassinated by an anti-Mormon mob. The assassins were acquitted in what many scholars have described as a sham trial. Fifty years later, as Mormons vied for political acceptability, Joseph F. Smith reminded his people that the Democrats’ states rights principles had failed to protect the first generation of leading Mormons. Now that the Mormons had placed themselves on the right side of the Republicans by officially ending polygamy, the Republican ideology of hierarchical constitutionalism was best suited to protect them and other religious minorities who, without the assurance of federal intervention when necessary, would always remain vulnerable to unconstitutional abuses by local and state officials (not to mention vigilantes) who viewed them and their faith as suspect. In the 20th century, it was the GOP’s evolution away from the party of Lincoln and toward the party of religion and family values that wedded the Mormons so thoroughly to the Republicans. During the same period, Mormonism also evolved from a pariah faith to become an American religion synonymous with social conservatism, family, and piety. And yet, the impulse to side with political parties that defend “religious liberty” in a more inclusive sense than many evangelicals have done so recently remains a key part of the Mormon political identity. That helps explain the reluctance among Republican Mormons to embrace their party’s current nominee for president. The church’s increasing internationalism tends to make American Mormons, many of who have served church missions in Spanish-speaking countries and Spanish-speaking areas in the U.S., wary of the kind of strident attacks against immigrants that have rallied other Republican voters to Trump’s corner. The Public Religion Research Institute found that compared with 36 percent of Republicans in general, 45 percent of Mormons say that “immigrants strengthen American society.” At the Atlantic, Jack Jenkins has noted that a large majority of Utah Mormons backs efforts to provide undocumented, law-abiding citizens a pathway to citizenship. So does the LDS church and the State of Utah. In 2010, the Mormon-dominated Utah state legislature initiated “the Utah Compact,” which called on immigration law enforcement to use their discretion to focus on routing out criminal activity among immigrant communities while taking care not to separate families unnecessarily through deportation. “We must adopt a humane approach [to immigration],” the compact reads, “reflecting [Utah’s] unique culture, history and spirit of inclusion.” In 2014, Dieter F. Uchtdorf, himself a German immigrant convert to Mormonism, and a member of the LDS church’s First Presidency, met with President Obama and other faith leaders at the White House to discuss common-sense immigration reform. During the meeting, Uchtdorf offered the Utah Compact, which the LDS church officially backed, as a potential model for federal immigration policies. It’s important not to overstate the Mormon embrace of Muslims or immigrants. Let’s remember that most Utah Republicans’ first choice for president was Ted Cruz, who is no champion of religious pluralism or immigration reform. Following the terror attacks in Brussels earlier this year, Cruz called on police to “patrol and secure Muslim neighborhoods before they become radicalized.” Late in the primary race, Cruz also began to parrot Trump on immigration. “We should deport [12 million undocumented immigrants]. We should build a wall, we should triple the Border Patrol,” he told Bill O’Reilly in February. The next month, Cruz won almost 70 percent of Utah’s GOP caucus votes. But if the Mormons’ chief concern was to protect their hard-fought political and cultural acceptance in the Republican Party, we might expect a majority of Mormons to have resigned themselves to the results of the primary process and to join Trump’s movement. They haven’t. So if not Trump, for whom are Mormon Republicans going to vote in November? For many Utahans, Hillary Clinton is (almost) as unpalatable as Trump. Emily W. Jensen, a popular blogger who also covers Mormon social media for the LDS church–owned Deseret News, explained to me that in the eyes of most Mormon Republicans, Clinton is “amoral … someone who accepts abortions and gay marriage and seemingly flaunts the justice system for her own gain.” With the choice between Trump and Clinton, Jensen says that many Republican Mormons “are praying for a miracle”—often the miracle that Mitt Romney runs as a third-party candidate. Fox wrote that the ascension of Trump, who as president “would apparently be comfortable with trashing the 1st, 4th, 5th, and 14th amendments,” just might depend on winning the Western states, notably Utah and Arizona. If somehow Trump captures the Rust Belt and Upper South, it would fall to the “Mormons and the newly enfranchised Hispanic population, which American Mormons are already more willing to work with than the rest of the Republican mainstream” to ride in on the White Horse and stop Trump.